On June 5, author Susan Lutz will earn her certification as a UC Cooperative Extension Master Food Preserver for Los Angeles County. She wrote this for Zester Daily, where she is a contributor. We share this lovely essay with you with the express permission of Zester Daily. Master Food Preservers get back to basics with an agenda to spread the word of home canning. I didn't eat a canned vegetable until I was 12. I was at summer camp, and the minute the canned green bean touched my tongue I spit it out, convinced it was rotten. I thought I'd eaten canned green beans before -- the green beans my mother grew in her large kitchen garden that she and my grandmother would "can" in mason jars and keep in neat rows in the basement pantry. To me, those were "canned green beans," and I loved eating them in the winter even though I thought my mother was crazy and old-fashioned for spending so much time and energy preserving the food she grew in our large garden plot. The difference between my mother's sweet, delicious "canned" beans and the gray, salty blobs I first tasted at summer camp reveals the stark difference between traditional food preservation and the industrial food system. 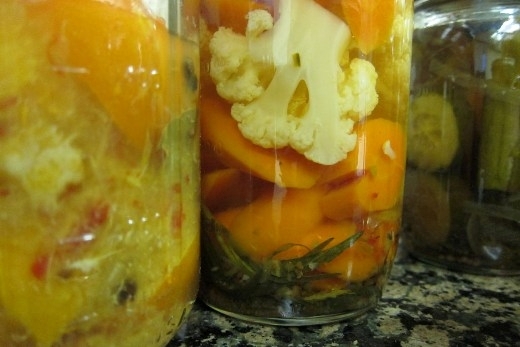 This stark difference is one reason behind the surge of interest in home canning and preserving. But there's another avenue to discovering the joys of successful canning, and it doesn't require a visit to your grandmother's notebooks or a search through mysterious old cookbooks. The Master Food Preserver program is an intense, 12-week program offered by the University of California Cooperative Extension Los Angeles. It is designed to not only teach the basics of safe and successful food preservation but to spread the word to local communities. I first heard about the MFP program when I took a class on holiday food-crafting from Joseph Shuldiner, director of the Institute of Domestic Technology. He mentioned his status as a Master Food Preserver, and I had to find out more about the program. I was instantly fascinated. The MFP Program covers not only canning but pressure-canning, freezing, dedhydrating, cheese-making, pickling, fermenting, the exciting list went on and on. I'd learned some of my mother's basic canning recipes back home in Virginia, and I even helped my father make his home-cured hams (which hang in his basement for a year before they're eaten.) But The MFP program was clearly more than old recipes rediscovered. The classes promised safe, USDA-approved methods for dozens of types of food preservation. And once the session ends, graduates are expected provide 30 hours of volunteer work and 15 hours of continuing food education every year. The goal is to teach simple and easy food-preservation techniques to residents in low-resource communities that would help them eat healthier foods and save money. In a place like Los Angeles where fruit literally falls from trees that line the city streets, food preservation can be a budget-stretcher and a life-saver. It's a rigorous program. But there was the promise of fresh fruit preserves, home-made goat cheese, and perfectly canned green beans. I wanted in. It turns out that I wasn't alone. Selection for the class is highly competitive. The program is offered around the country, and its Los Angeles branch began in 2010. Two classes of 18 students apiece have graduated so far. When I learned the program was accepting applications for the third class, I sent in my application and prayed silently to the gods of cheese-makers and the spirit of my Grandma Willie (whose Shenandoah apple sauce still haunts my dreams). I was surprised and delighted to find that I was accepted into the program. And thus begun my immersion into the boiling water bath of preservation information. I quickly learned that the program is more focused on teaching trainees how to share information with others than it is about teaching endless food preservation techniques (although I must say that my knowledge and interest in food preservation has grown exponentially since I started the class). All MFP trainees are expected to have a solid knowledge base when they enter the program and to keep learning new techniques after the course ends. Our lead instructor, chef Ernest Miller, runs each class with military discipline (he's a former Marine), culinary expertise (he's the chef at the Farmer's Kitchen, a nonprofit community-oriented kitchen) and deep wells of knowledge (he's a graduate of Yale Law School). I thought I knew everything I needed to know about jam-making, but when he and two former graduates of the class began their lecture, I realized there was a lot more to learn. Miller started the class by saying: "This isn't Smucker's." Over the next four hours I learned the difference between jam, jelly, preserves, conserves, marmalade, fruit spread and fruit butter. And that was only the beginning. 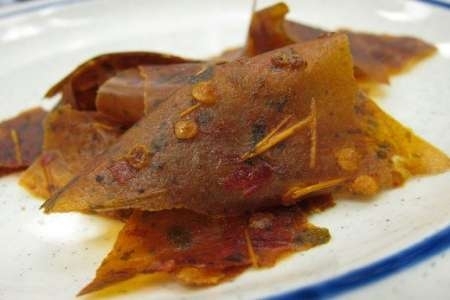 Salsa leather, from the Master Food Preserver program. 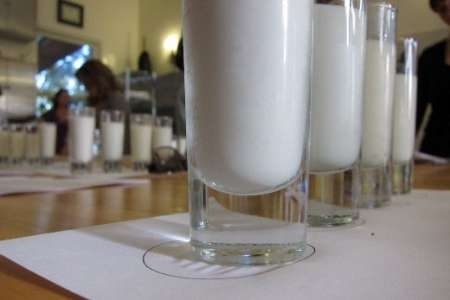 The "blind milk test taste" comparing goat's milk, organic single-producer milk, and "grocery store" milk sourced from multiple producers. 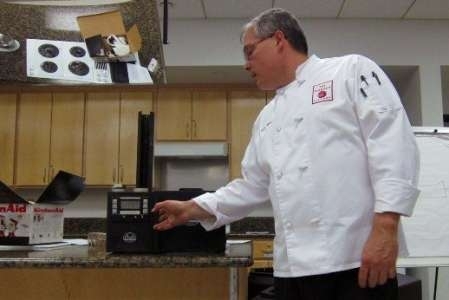 Chef Ernest Miller demonstrates the use of a smoker. And, with luck, my youngest daughter might someday taste a commercially canned vegetable and spit it out, saying "What's that?!" I'll hand her a spoonful of loquat butter to get the bitter taste out of her mouth and say, "Kid ... there's a program you should know about ..."
Zester Daily contributor Susan Lutz is a photographer, artist and television producer. A native of Virginia's Shenandoah Valley, she currently lives in Los Angeles, where she is writing a book about heirloom foods and the American tradition of Sunday dinner. She also blogs about the subject at Eat Sunday Dinner. Carol Ann Susi did a wonderful job demonstrating the canning process at the LA County Fair.